On Sept. 7, a man was arrested on the first floor of Schmidt Hall on charges of burglary, invasion of privacy, criminal trespassing and harassment, according to the WCU Public Safety crime log. The event raised questions on campus security, specifically related to traditional housing. According to anonymous sources familiar with the events in Schmidt Hall, it took over an hour for the suspect to be caught and brought into custody. In this time “student vigilantes” attempted to take matters into their own hands, searching for the suspect themselves. The official Public Safety report listed a timeline of 5:59 p.m.-8:10 p.m. between the first reports and custody of the suspect. Likewise, the official West Chester University Facebook page’s timely warning stated the suspect was still at large as of 6:58 p.m., almost an hour after the initial reports. Nancy Gainer, the Executive Director of Communications at West Chester University, spoke on the topic of security. According to Gainer, over 900 cameras are placed on campus, with trainings taking place frequently for the “twenty-five fully commissioned officers” and other safety officials. Gainer also claimed that the individual was “caught immediately” by the officers, contrasting the previous student reports. The suspect was processed on-campus, where he was later taken to the Chester County prison. Gainer’s comments do not address the reported lack of cameras in traditional halls. 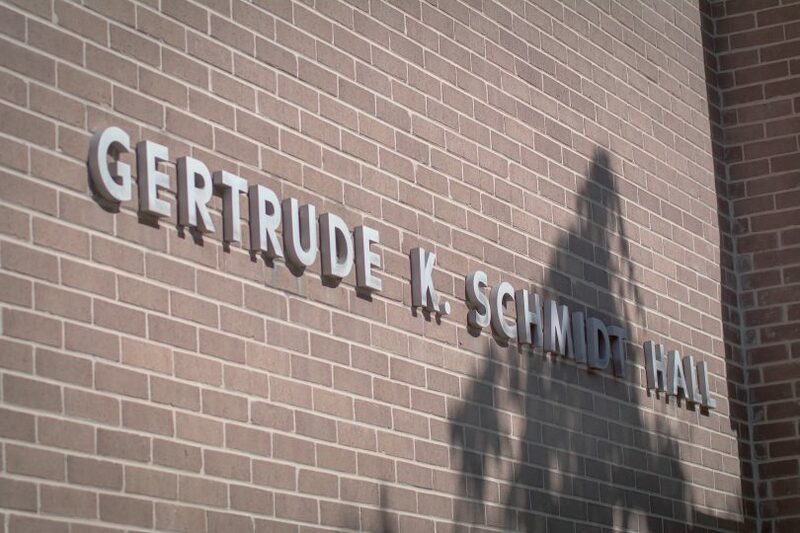 The trespassing occurred during a Residential Life event, “Schmidt Hall Live,” which invited multiple dormitories to attend and recreate skits from late night shows. According to another student, ResLife encouraged student coordinators to continue the event while the search and investigation was taking place. “The event was happening, and right outside public safety officers were investigating,” said the student, stating they felt like the event served as a distraction. Resident Assistants were instructed not to discuss the events of the trespassing, and when we pressed for further information, one RA suggested we go to Public Safety to receive the official report–a sentiment shared with and reflected by the WCU Facebook Page. “Seriously not OK…where are the safety measures and precautions to prevent this? Having my first born at your college for less than three weeks, this is not acceptable in any form,” reads the “Most Relevant” comment on the Facebook post about the incident. The comment reflects the emotions of many parents, who were reportedly asked to contact Public Safety after they called Schmidt Hall, according to an anonymous source. This topic was specifically brought up in the context of Affiliated Housing, which has extensive security camera coverage, private bathrooms and automatically locked dorm rooms. “The individual tagged along behind a student,” Gainer explained, when describing how the suspect gained access to the dormitories. While key cards are required to enter the building, anyone can enter once the door is open. Before 8:00 p.m., no public safety officers are required to be at the door. Technically, anyone can enter the building and have free access to a public rest room with showers, a problem exclusive to traditional housing. This response contrasts the “doors open” attitude of ResLife events, in which multiple dormitories were invited to attend. She also hopes to further encourage students to sign up for the West Chester University emergency alerts, which would be sent in the form of a text message to their phones. Lastly, Gainer wants students to be aware of the 24-hour card access to the dormitories, and the officials placed their after hours for students’ safety. Gainer also noted that the suspect was not a student. Students in Schmidt Hall reported the suspect wearing a purple polo shirt with the golden ram logo and black slacks. For any students who seek or need counseling services, visit https://wcu.caresforyou.org/ to complete an anonymous online questionnaire, or call 610-436-2301 for counseling services. For more information on sexual assault awareness and prevention on campus, please contact WomensCenter@wcupa.edu or call 610-436-2122 for the Center of Women and Gender Equity. For the mission and value statements of the West Chester University Public Safety officials, students can visit wcupa.edu/dps. Public Safety is located at the main entrance of the People’s Building on University Avenue and Church street. They can be contacted at 610-436-3311. Sam Walsh is a third-year student majoring in special education and English with a minor in autism studies. SW850037@wcupa.edu. Max James is a fourth-year student majoring in communication studies with a minor in French and creative writing. MJ853459@wcupa.edu. Great article. I don’t think parents should be blaming the school. Something like this could happen almost anywhere. It is a known fact that the students are responsible for seeing who follows them into buildings.